Do you fancy a little weekend baking? Despite my main oven literally blowing up this past week (cue catering panic), I had a strong urge to bake. Luckily I know that my tiny conventional ‘top’ oven is a pretty efficient baker. While my workhorse fan oven gets (got) the cast iron pots of slow-cooked stews and sheets of vegetables to roast, the dinky top oven gets the oh-ah stuff, the baking. So despite jet lag, and the energy levels of a particularly lazy sloth, I gathered my baking ingredients and got stuck in. I could’ve opted for these crunchy, delicate Cashew and Three-Ginger Biscuits (store cupboard ingredients). And I knew my daughter would love me forever if I made Marbled Peanut Butter and Jam Banana Bread (alas, no bananas). But I knew it had to be bread bread. For me travelling solo is quite a chore. Even familiar airports I find confusing, and the security stressful. Add to this weather delays and cancellations at either end – polar vortex (again) and a tornado watch – and by the time I open my front door I am ready to collapse in a messy puddle of hormones, airline food and stale clothing. If I only I weren’t so dehydrated. As I said, solo travelling is a chore. Luckily baking is my antidote. After a quick nap, two pints of water and a much-needed shower I am ready to do something productive and tangible. And what is more productive and tangible than turning basic ingredients into one of the most versatile foods known to humankind? And of course there is that smell. The powerfully evocative aroma of freshly baked bread is associated with pleasure, comfort, and even life itself. It is often near the top of the list of favourite smells: right up there with line-dried laundry and a freshly washed baby. I completely agree. Wholewheat or white: they both smell amazing. Right? Unless you can’t digest gluten it is very hard to resist homemade bread. And even then it is probably an exquisite kind of torture. 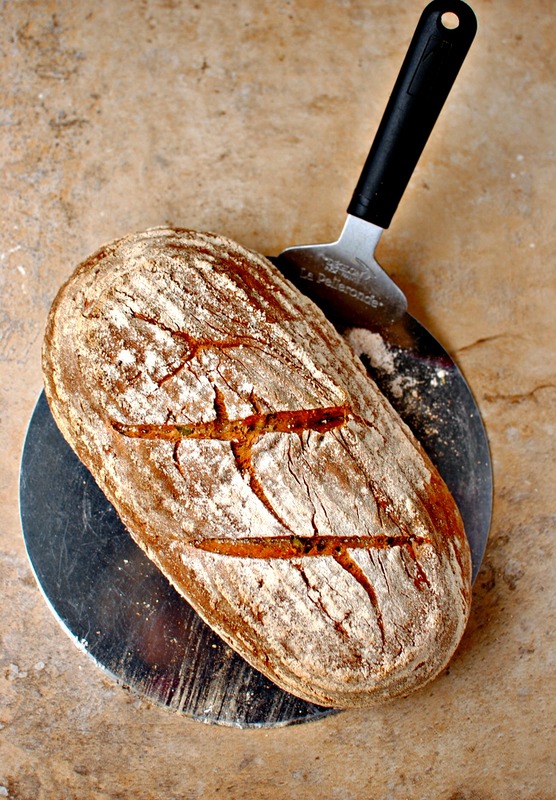 I have heard of (intentional) bread–shunners who have to leave supermarkets – or cross the street from a bakery’s open door – to avoid the irresistible aroma of this special alchemy. And it is a special alchemy: the interaction of enzymatic and chemical reactions during the dough’s rise (fermentation) and the thermal reaction in a hot oven is what makes that damnably delicious smell. Admittedly the ferulic acid in the wheat bran slightly inhibits the aroma in wholegrain bread, but I am sure the difference is minute and of interest mainly to nerdy scientists. Nerdy scientists are apparently – this is true – working on using this information to make wholewheat bread ‘more appetizing.” Whatever. As for today’s recipe we don’t have bread every day so when we do eat it I try and make sure we have something like this in the bread bin, or in the oven. Special occasion bread for everyday eating. You can of course buy really fantastic bread these days. Despite the increasing demonization of gluten in the popular media artisan bakeries are one of the glimmers of economic hope – at least here in the UK. But real bread – good bread – can be easily achieved at home without any special equipment or fancy baking skills. That’s why I like it: I don’t have fancy baking skills. But I do like good bread. And the smell. Oh, the smell. Despite the mild day I deliberately kept the doors closed to keep that scent all to myself. 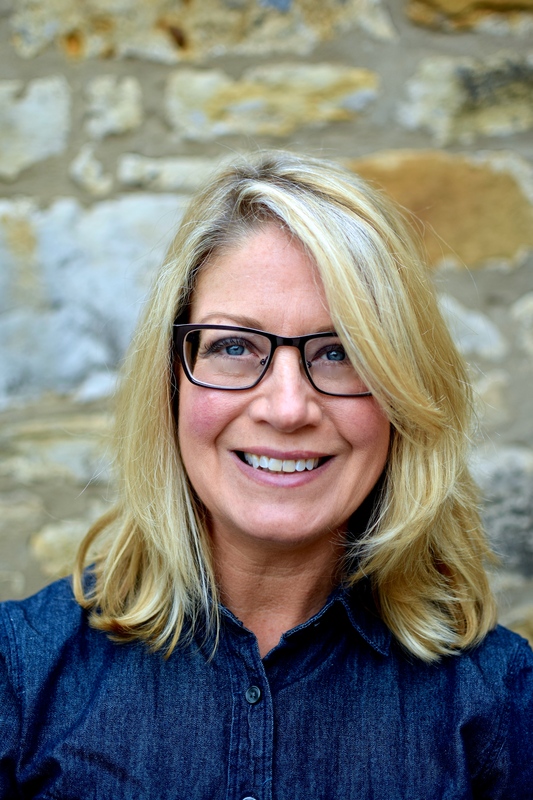 Breadmaking is such a joyous thing to do anyway – I can’t help smiling when I knead (well, it may be more of a grimace with the effort) – but with baking comes the joy of breathing itself. Maybe that’s just me. 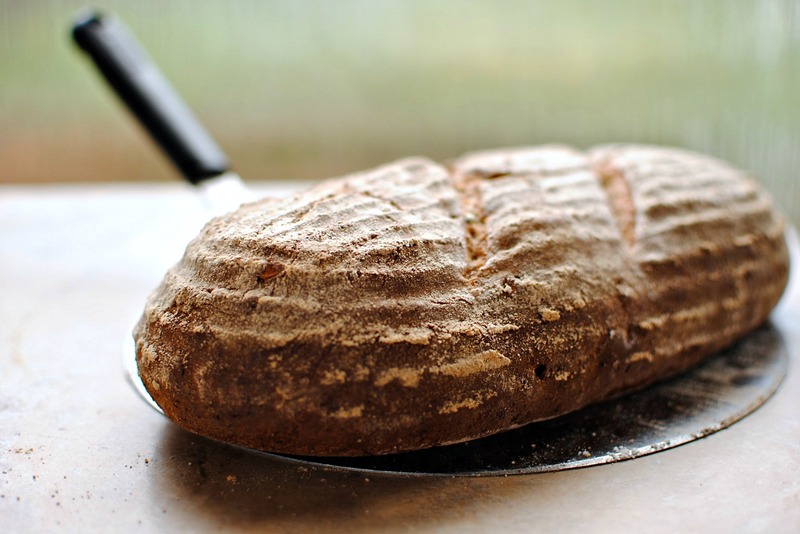 This is the last of my recipes for the Sharpham Park month-long spelt challenge. I was away for half of the time but I still managed to plough through most of my box of spelt goodies – the flours, the risotto mixes and the porridge. A delicious month. My other recipes are: Jerusalem Artichoke and Spelt Risotto with Blue Cheese and Savoury Chelsea Buns. I have also made up various morning porridge concoctions, including adapting this India-inspired breakfast recipe of mine to use chewy, nutty spelt porridge grains. One time I just added some dark chocolate chips – mmm. And I can’t forget about my Carrot and Marmalade Cake made for one of my cancer nutrition groups with Sharpham Park Baker’s Blend flour. All were made a little more delicious with these great grains. So, getting a bit personal: what are your favourite smells? The seeds I list are what we like and what I think work well with nutty, rich spelt flour. However, I would urge you to look in your cupboards and use what you like. I don’t add fruit to my bread as to me that turns it into a fruited bread – a whole different bready beast altogether. If you want to add fruits or heavier nuts, thickly roll out the dough, spread over the fruits and fold inward from both sides or as a blanket fold. The recipe is a basic one that many bakers use, with my little adaptations. I have read both Short and Sweet by Dan Lepard and Bread by Daniel Stevens, the latter from the totemic River Cottage Handbook series. Through these great reads I have learned many tips that I incorporate in my general baking, including this bread. Stevens’s book especially is a brilliant and not too overwhelming primer if you want to know more of the whys and hows of modern baking. I recommend both, with Lepard’s book being more sweet than savoury. Btw, if you are unfamiliar with baking yeast terminology – it can be confusing – this article on Huffingon Post Taste will put you right. These directions are for hand-mixing. However, the bread can be done to the dough stage/first rise in a bread maker. You will need an oiled, 1 lb baking tin. 1. In a large bowl whisk together the flour(s), salt, yeast and all of the seeds. 2. Pop the warm water, beer (if using), your chosen sweet liquid and the oil in a jug and mix. Stir the liquid into the flour mix to make a soft dough. I find it easiest to hold the bowl against my body and use my other hand in a claw shape to mix the ingredients. 3. Turn the dough out onto a floured cool surface and knead anywhere from 5 to 10 minutes, depending on your kneading prowess. A good test to see when the dough is ready is to try and stretch it and see how thin it gets without snapping. Spelt is lower in gluten than ordinary wheat flour so you won’t be able to stretch it too far but you should be able to see a bit of light shining through. In any case, the dough you want is elastic and not at all sticky. 4. Clean and oil the mixing bowl; pop the kneaded dough inside. Cover the dough with a clean tea towel and leave to rise by about half (spelt, and wholemeal at that, doesn’t rise as much as white bread flour) – this will take about an hour in a cool kitchen. 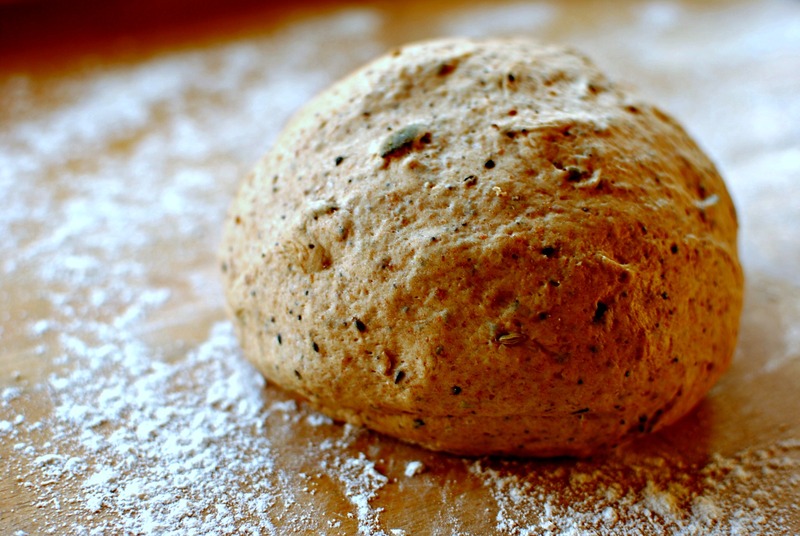 When risen, use your fingers to deflate the dough – no need for vigorous pummelling. If you wish to only do one rise, knead it, shape it and pop it in an oiled tin to rise. Turn the oven on its highest setting at the start of the rise. 5. Shape the dough to fit your baking tin. Flour the dough. I used a proving basket that shapes the bread that will be popped onto a baking stone or hot tray (see note after step 8). Cover the dough and leave to rise again by half. 6. While the dough is rising, set your oven to its hottest setting. If you are using a baking stone pop this in at the same time, in the middle of the oven. Five minutes before baking, place a heat-proof bowl of hot water in the bottom of the oven (if you can). This will help to give the oven a moist atmosphere that helps with the initial rise and will make a lovely crust. Not necessary, but easy to do and gives a more bakery-like finish. 7. Just before baking the bread either make one slash along its length, or two or three slashes slightly diagonal to the width – tin loaves will just need the one along its length. This is one of the keys to a good, even rise, and prevents the loaf from bursting at the bottom or from the sides – a pressure valve, if you like. I use a serrated bread knife. Others seem to use a craft knife. Just make sure it will cut at one attempt; and not deep – just a slash to split the dough and no more. 8. Put the bread in the oven and bake for 10 minutes on this high setting. After this time turn down the oven to 180C/350F and bake for 40 minutes, checking the bottom at 35 minutes. Tap the bottom of the loaf – if it sounds light and almost hollow, the bread is done. There are other ways to go about the baking regarding temperature adjustment but this works well for me. If you have success with another method, please use that. If, like me you used a proving/proofing basket, heat a heavy baking tray or baking stone and then shape your bread to fit the basket (they are usually round or oblong/baton) and cover for its second rise. After the rise, use one hand to ‘catch’ the loaf as you tip it out, and transfer it onto a peel (or back of a cool tray) to place it safely onto the heated baking stone while it is still in the oven. Give it a quick forward shove and it will slide right on. 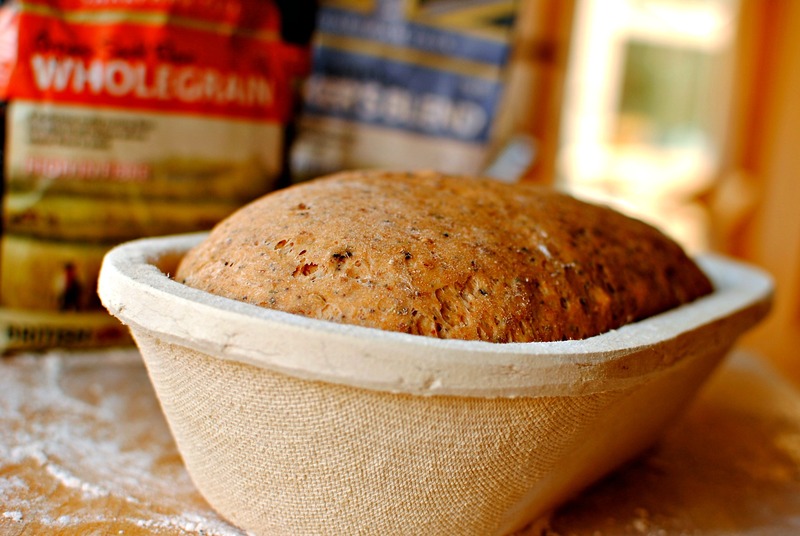 If you are shaping the bread yourself place it directly on a baking tray to rise, covered. Both of the books mentioned above give great tips for not only the baking process but also the best techniques to shape loaves. When the loaf is done, leave to cool completely on a rack. Note: This bread is absolutely delicious with just one rise so if you don’t have time or inclination for two rises, skip it. But I think it adds a little to the taste and texture. This bread looks and sounds amazing Kellie!! Looks delicious, Kellie! I love hearty breads like this. Just looking at the pictures is making my mouth water! Yum! Yes, long travel can be quite the hassle, and I’ve found I have become more sensitive to it as the years have passed. This looks yummy. Spelt is my favorite flour to bake break with. And you’re not going to believe this but I just had a nutty dark break today with sunflower seeds in it. And I thought, that would be nice to add seeds to my spelt bread next time!! 😉 Will try it out with dark beer next time too, love that idea. Do add the seeds! I love a bread from a bread making cooperative in the Scottish Borders (BreadShare) and they do a sourdough one (all are some kind of sourdough) with these seeds. I am not normally a fan of coriander outwith curry pastes, but I love them in here for some reason. It was good to unwind from the yucky travelling with a bit of bread making. Very peaceful. I have to bake tomorrow. You’ve reminded me of how important baking bread is to me especially at a time of manic activity. Yes, it slows you down, doesn’t it? You can’t rush good bread, but you can do other things while it is proving. Hopefully something nice – not paying bills. I will check on Instagram to see what you make! I’m trying not to eat any bread at all for a while, Kellie, as it seems to be playing havoc with my body once again, but this sure looks delicious! Thanks, Liz. I hope your tum is better soon. What a wonderful looking bread! My favourite smells are cakes and cookies baking as well as cooked onions and garlic! 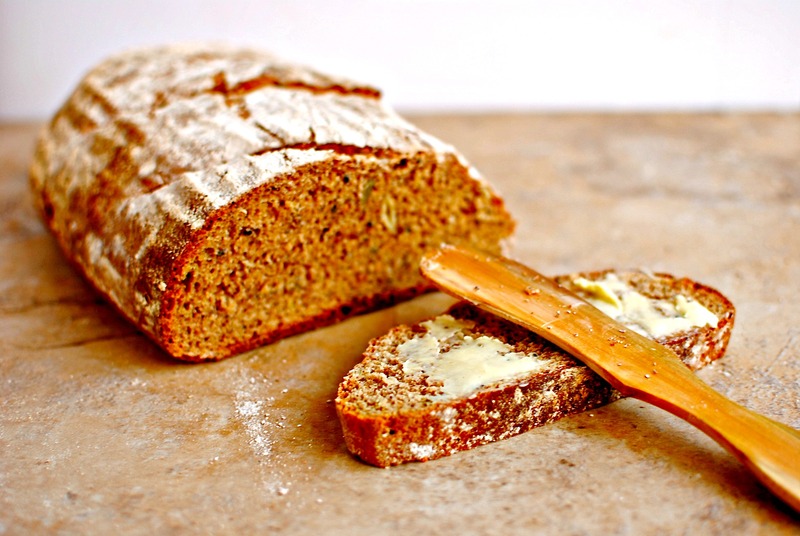 The Seven Seed Spelt is a compelling reason to bake bread, it is scrumptious! A favorite smell is lavender. Especially in the heat of summer when the garden is filled with buzzing bees and the heady scent of blooming lavender. Commercial breads don’t agree with me, but properly made spelt bread – homemade or bought from a good bakery (not a chain one) – is fine for me in small amounts. I think I appreciate it more now that we are buying/making quality bread with proper ingredients. 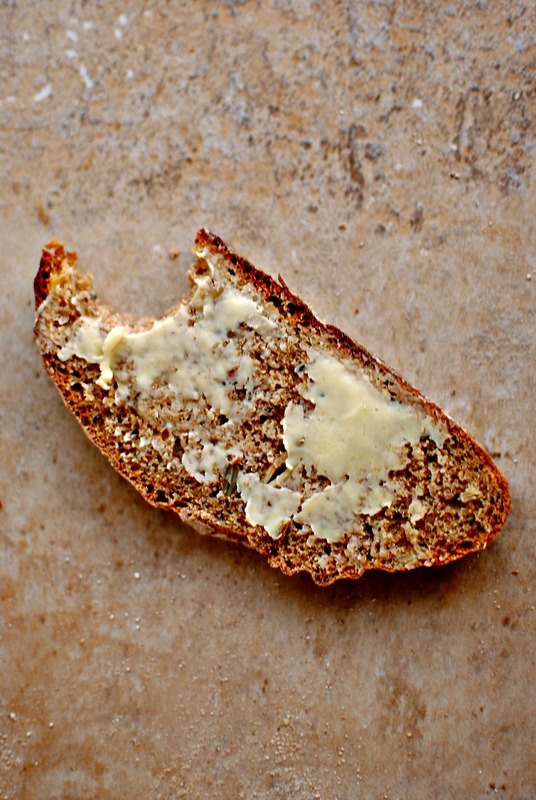 Seeds – espesh the coriander and Nigella – are amazing in bread. More filling too. Beautiful! I love the picture where it’s slathered with butter – yum! Gorgeous bread, Kellie! I’m with you on the special occasion bread for every day eating. i don’t eat bread every day, though my office has the most amazing selection of Swedish breads delivered each day and walking past the bread bin without sneaking a bite of dark rye bread is next to impossible! 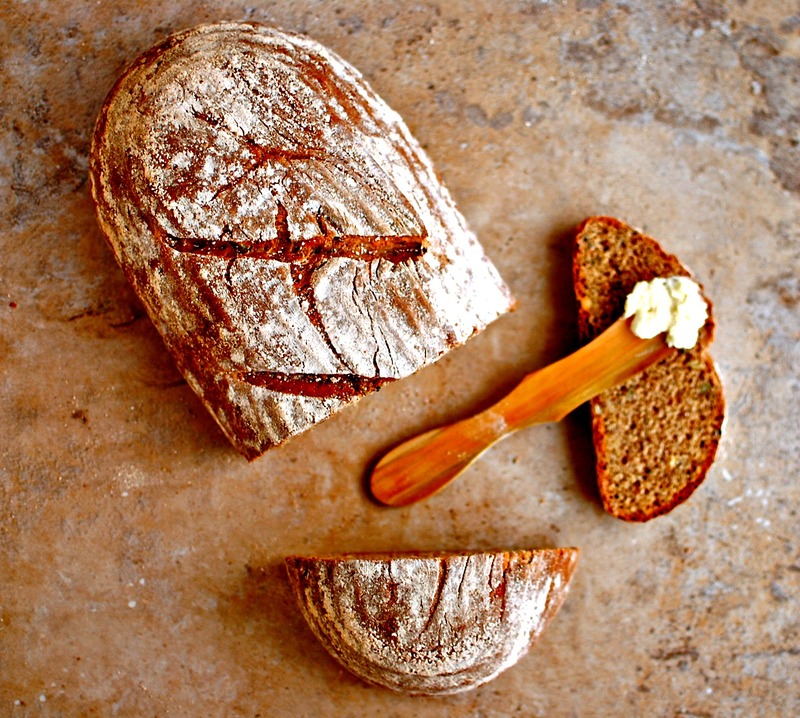 I love baking with spelt flour so this bread is right up my alley. I need to get a proving basket! How beautiful! I would find the office bread delivery thing pretty challenging. At work, patients and their families often bring in tins of biscuits and sweets for staff and for the cancer centre itself. We can’t tell people not to do this but we always have bowls of fruit as an ‘antidote’ (and of course the brought in goodies always get eaten). If people brought in Swedish bread I would be in trouble! Health halo and all that 😉 And yes, I am loving my proving basket – get one! This bread looks so good! Like something you’d see out of a bakery! I definitely want to try it – i love breads with all the nuts and seeds in it! Such great flavor and texture! I hope mine comes out as pretty as yours!! Wonderful post and oh, by the way, YUM!! I almost took a bite out of my computer screen when I looked at those scrumptious bread photos! Oh my goodness! I’m a serious bread lover and this looks a bit less guilt-ridden. Perhaps I’ll give it a try. Yum!